Sea of Stories is an important cultural landmark. Peninsula Productions, in partnership with the City of White Rock and funding from Heritage Canada, created this original musical as a tribute to the unique seaside town of White Rock in celebration of Canada’s 150th birthday. Written by Shawn Macdonald, directed by Peninsula Productions’ artistic director Wendy Bollard, and with music composed by world-renowned boogie-woogie pianist Dominik Heins, the play opened at Coast Capital Playhouse on Aug. 9 and continues there until Saturday, Aug. 26 at 8 p.m. (Wednesday through Saturday), with 2:30 p.m. matinées on weekends. Tickets are $13 for students, $22 for seniors, and $27 for adults. Call 604-536-7535 for tickets or visit peninsulaproductions.org. This new musical is not full of show-stopping production numbers that are Broadway bound. It is a charming, sensitive piece that tells a history of a small city. 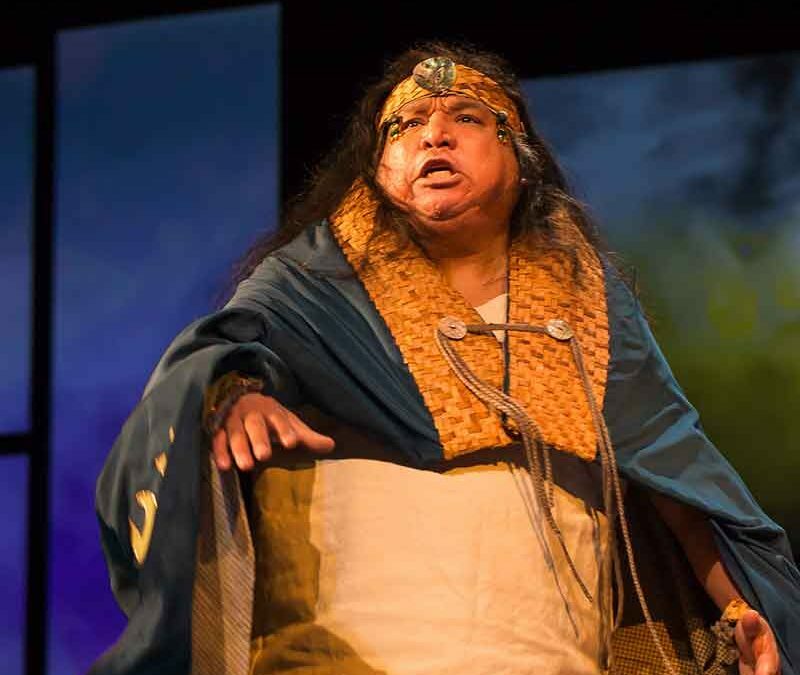 More than that, though, the cultural heritage of Semiahmoo First Nation looms large in the telling. The story haunts me, and told me things I did not know – but should. We all should know the history. It gives us understanding and appreciation of our piece of Canada we all share. Sam Bob play X’ya:s, the Great Transformer. He tells the story of the Semiahma people. Semiahmoo is the place, Semiahma are the people, we are told. X’ya:s is an immortal that falls in love with a Cowichan princess. Their marriage is forbidden, but the lovers are determined. X’ya:s picks up a huge white boulder and tosses it as far as he can. Where it lands is where he will build his new clan. The big white rock landed in a pleasant, crescent bay called Semiahmoo. It is a lovely story, but the fate of Semiahmoo First Nation has been a struggle. Please forgive me if I am not using the Semiahma and Semiahmoo correctly. I didn’t see the script, or all the research playwright Macdonald collected to write this play. And internet sites didn’t give me much information either. My only source for the story of X’ya:s hurling the big white rock came from Sea of Stories. We need to know these things, especially if we live as neighbours to White Rock. The Semiahmoo Reserve was established by the Canadian government in 1887. The reserve is small, and the population dwindles. From 1942 to 1996, 172 acres, or more than half the reserve’s area, was leased by the band to the Municipality of Surrey for recreational “parkland” purposes. The City of White Rock and the City of Surrey both used the land, known as “Semiahmoo Park,” for landfill and municipal infrastructure purposes. In 2014, the First Nation announced it was endeavouring to remediate the soil, which was contaminated by the municipalities’ usage. Water supply is unsafe, and “we have to replace the whole water system here on the reserve,” said Semiahmoo First Nation councillor Joanne Charles, who was at the gala opening of Sea of Stories. We learned of the current problems of the Semiahmoo through a school project report given by Jeffery, a reluctant teenaged newcomer to White Rock. Played brilliantly by Anthony Goncharov, this typical teen goes from “whatever” responses to really caring about all the people of White Rock. Transformed? Henry Thrift may have milled the wood for the original White Rock pier, and a small population of settlers may have agitated for cityhood independent of Surrey, and so many other small bits of White Rock history may have had an influence on what we have today. White Rock is not just a town for the retired, or a small space allotted for First Nations and incomers. Sea of Stories shows us more. You need to see this show. It is more than just musical theatre entertainment – it is even more than just history. It is personal. Thanks to Peninsula Productions for instigating the production. It’s our job now to attend Sea of Stories and pass along the lore and the culture.